SHOW YOUR SUPPORT FOR WEST MORRIS SOCCER CLUB! 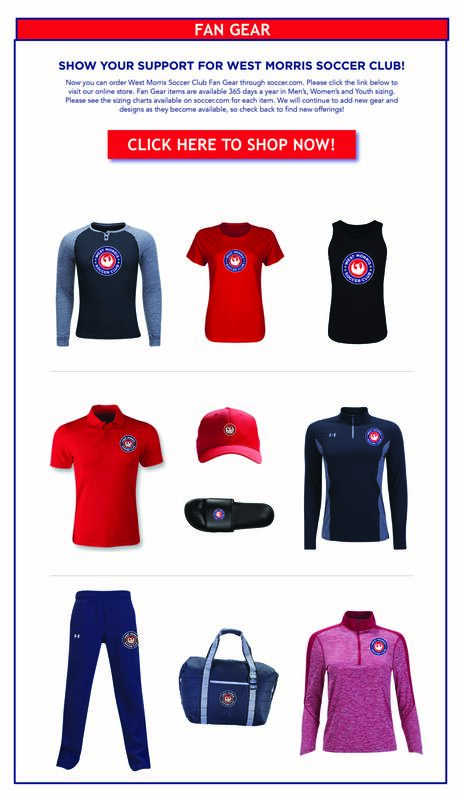 Now you can order West Morris Soccer Club Fan Gear through soccer.com. Please click the link below to visit our online store. Fan Gear items are available 365 days a year in Men’s, Women’s and Youth sizing. Please see the sizing charts available on soccer.com for each item. We will continue to add new gear and designs as they become available, so check back to find new offerings! All WMSC embellished items will have a slight delay for customization, please keep this in mind when choosing shipping speed. 2 DAY or Overnight delivery will be applied once the order is customized, not from when the order is placed.